Rome is known as the Eternal City and is one the most fascinating cities in the world. An ancient place full of historical glamour and modern chic. The Colosseum, Vatican Museums, Tivoli, Pantheon and the Trevi Fountain are just a few of the highlights that keep tourists flocking to Rome year after year. 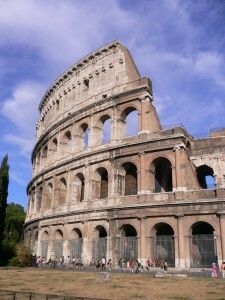 With so much to see and do in Rome, there is plenty of accommodation available. The city is at it’s busiest between June and August, Easter and at Christmas. It’s always advisable to book a hotel in advance especially at these busy times. So, whether you are looking for a 3 star hotel in Rome for a short sightseeing trip or maybe a luxury 5 star hotel for the vacation in Italy that you have always dreamt about, you will find that perfect hotel from our list of highly recommended 3, 4 and 5 star Rome hotels. The recently refurbished Hotel Milani is centrally located near Rome’s Termini train station and offers guests easy access to all of Rome’s most popular tourist attractions. The comfortable single, double and triple rooms include private bathroom, air conditioning, heating, satellite TV, desk, direct dial telephone and wireless Internet connection. Close to bars, restaurants, shops and Rome’s best sightseeing, Hotel Amadeus is a clean and comfortable budget hotel. Conveniently located, Hotel Amadeus offers a mix of soundproof rooms that are equipped with modern amenities including wireless Internet and satellite TV. Access for the disabled, air conditioning, 24-hour front desk and much more are available at Hotel Amadeus. Hotel Canada is a friendly and relaxed hotel located in the Castro Pretorio district and is within a short walking distance of Termini train station. This very popular Rome hotel offers well decorated rooms that are equipped with modern amenities. Request a room on the upper floors for a great view over Rome. Hotel facilities include multilingual staff, air conditioning, luggage storage and tourist information. Located in the heart of Rome, Hotel Quirinale is a elegant four star hotel that is close to the Roman Forum, Colosseum and the Vatican. Rooms have air conditioning, mini bar, satellite television, Pay TV, private safe and 24 hour room service. Hotel facilities include a restaurant, bar, internet access, and laundry service. Pets are allowed in Hotel Quirinale. Hotel Grand Palatino is a perfect four star hotel for families, business travellers and tourists looking for comfortable accommodation in the centre of Rome. The hotel offers 208 single, double, twin and triple bedrooms that are soundproof and are equipped with modern amenities. The hotel features two restaurants, a bar, a congress centre, laundry service and Internet access. Hotel Britannia is a boutique hotel located close to Rome’s Trevi Fountain. Housed in an elegant palazetto building, Hotel Britannia features beautiful interiors and luxurious furnishings. All 33 spacious rooms feature marble bathrooms and offer modern amenities including air conditioning, satelitte TV, electronic safe and wireless Internet connection. A delicious American breakfast buffet is served from 7.30 a.m. to 10 a.m. Housed in a historic palace that was built in 1880, Hotel Splendide Royal is an amazing luxury Rome hotel located in Rome’s historical centre. The 68 lavishly appointed rooms are equipped with modern amenities and many rooms feature a private balcony with memorable views. Enjoy a meal at Mirabelle, the hotels Michelin-star winning restaurant. Hotel Splendide Royal is one of Rome’s most exclusive luxury hotels and is highly recommended. Part of the Starwood Hotels Group, and built in 1894 as the first 5 star deluxe hotel in Rome, the St. Regis Grand Hotel regularly hosts international dignitaries, heads of state and celebrities. All 161 rooms are lavishly appointed in an combination of Empire, Regency and Louis XV styles. Property facilities are what you would expect from one of the best hotels in the world. A butler is available to all guests 24 hours a day.